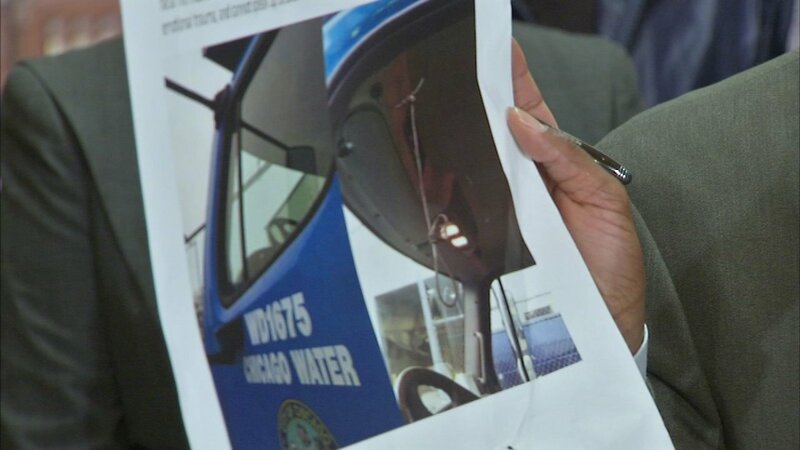 Alderman David Moore alleges that a photo shows a noose inside a city water department truck. CHICAGO (WLS) -- A Chicago alderman is demanding hearings into what he alleges is racism in the city water department. Seventeenth Ward Alderman David Moore says employees have been denied promotions because of their race. Moore also displayed a picture taken of a Water Department truck with what he says is a noose hanging above the steering wheel. "For that person to get a slap on the wrist and not be terminated because of our zero tolerance policy is a slap in the face to the African American members and workers of the water department," Moore said. A spokesperson for the water department issued a statement saying, "The photo in question originally surfaced in April; this incident was investigated by DWM senior management - including by Commissioner Conner during his first week on the job - and found to be a misunderstanding. The employee used the string for hanging pens while on the road. He personally apologized to his coworkers when he learned that some had taken offense. Since his appointment in June, Commissioner Conner has been clear that he is committed to an inclusive, welcoming environment at the Department of Water Management, and that the Department will not tolerate racism, sexism or homophobia. He has instituted additional Equal Employment Opportunity (EEO) training for Departmental managers and supervisors in consultation with the Department of Human Resources, and continues to foster a culture of understanding and inclusion."